Unravelling 1987: Will the real exiles please stand up? Will the real exiles please stand up? Who is an exile? What is an exile? Is an exile someone who cannot return to his/her country because he/she will face injustice? Is an exile someone who doesn't want to return because he/she does not want to answer charges levied against him/her? Is an exile someone who has completely no trust in the system and no faith that Singaporeans will stand up for him/her, if the cause is just? Is an exile someone who feels that freedom in a foreign land is better than being jailed at home? Then why do some stay and fight in Singapore even though they face many instances of unfairness and injustices? People like JBJ, Chiam See Tong and even Chee Soon Juan. They stayed and they fought the good fight. They brought democracy to our lands and they lend us a voice when we were deaf. 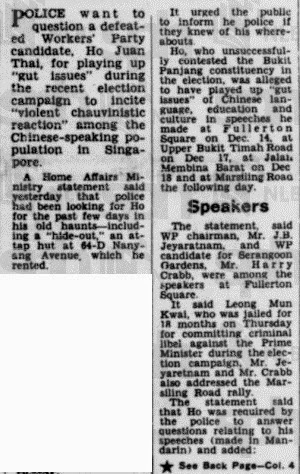 HO made what were considered "Chinese Chauvinistic" speeches as a candidate for Bt Panjang during the 1976 General Elections. 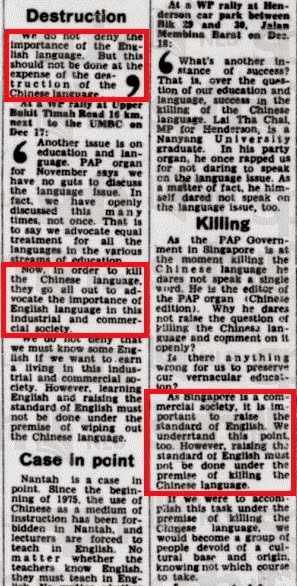 He was accused of working up racial tensions by accusing the PAP of "wiping out", "destruction" and "killing" Chinese language at the expense of promoting English language. When Ho was wanted by the Police for questioning regarding his inflammatory speeches, he decided to abscond to Malaysia and later London with the help of Tan Chay Wa. 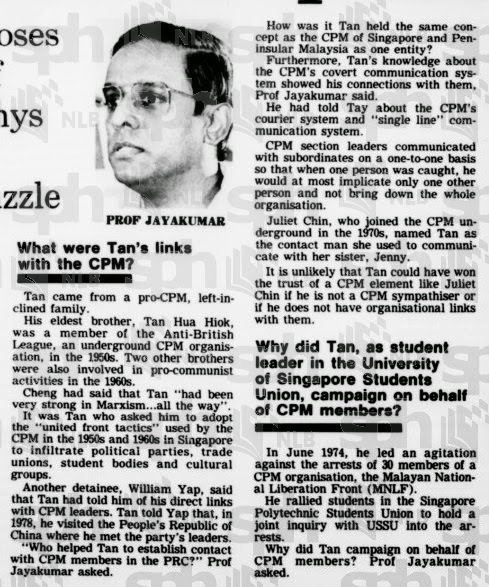 TCW was a Communist cadre who was later sentenced to death in Malaysia for possession of firearm. Tan Wah Piow, another exile featured in the film, also campaigned for Tan Chay Wa to be spared the gallows. Ho also publicly declared that he forged his passport to enter UK in July 1977 when his passport supposedly expired in Dec 1976. Ho had repeatedly claim that the Singapore authorities would not issue him a passport and that he would be detained unfairly if he returned to Singapore. The authorities repeatedly assert that they cannot give Ho a passport because he is being investigated for passport forgery but they will grant him one time pass to enter Singapore. They claim that he is wanted for questioning because of the inflammatory speeches that he made during the 1976 General Elections. Going by past cases faced by JBJ, Tang Liang Hong and Chee Soon Juan, Ho was most likely wanted for sedition or libel, and running away on a forged passport obviously didn't solve the problem. Clearly, Ho should answer some of these questions raised. If allowed to come back without any conditions, then any criminal who had escaped Singapore would be asking for the same thing. This blog has written several posts about this leading leftist leader. You can read them here, here, here, here and here. Briefly, TWP first hit the headlines in 1975 when he was jailed for a year for rioting at the Pioneer Industries Employee Union. TWP claimed that he was not present at the scene, but the state called upon various witnesses who thought otherwise. After serving his jail term, TWP was due to be enlisted for NS, but he decided to escape to Malaysia illegally and then to London subsequently. His reason for not serving? TWP said that he feared for his personal safety and he could be assassinated should he enlist. Then the natural question would be - wasn't being imprisoned just as dangerous? One did not join the Communist club like they do the Tanah Merah Country Club today. Communists in the 60s and 70s did not carry a card to say that they were members. The state has always argued that TWP was a communist and he's being wanted by the ISD for questioning. I guess they can only prove this by communications intercepts and by association. The same could apply for persons detained under ISA today for violent political Islam. Associations were what TWP had. After serving his jail term, TWP was said to have skipped town with the help of communist operatives. 3 of those who helped him eventually joined the Communist Party of Malaya. TWP hid in Malaysia for a month before forging his exit permit, moving to Thailand, Amsterdam and finally settled in London. In London, he was aided by Malcolm Caldwell, another well-known British communist who died in Cambodia under the Khmer Rouge. In June 1974, when 30 members of the Malaysian National Liberation Front, a CPM proxy, were arrested, TWP led the protests asking for their release. In 1982, when CPM cadre Tan Chay Wa was being sent to the gallows, TWP campaigned for his case in London. 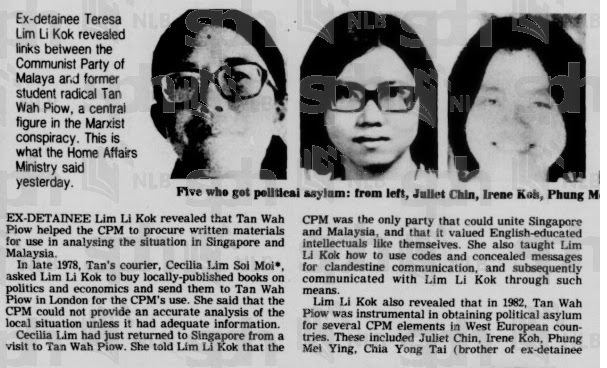 In fact, many of TWP's close comrades, such as Juliet Chin and Chia Yong Tai, during the 70s eventually joined the violent armed communist struggle. When the communist threat was over and defeat was apparent, five of TWP's communist colleagues, who were also his comrades during his days as student activist, managed to gain asylum in Europe with his help. 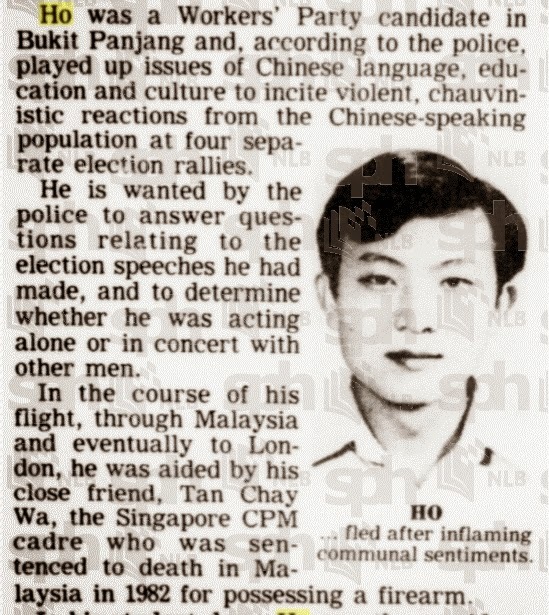 Now, if you were Tan Wah Piow, having escaped NS and helped a whole bunch of communists, would you return to Singapore? 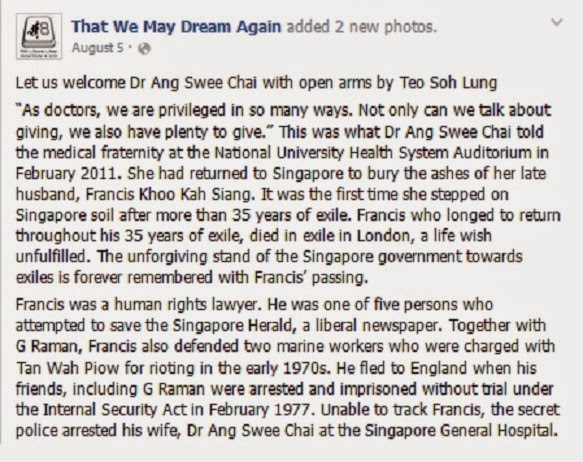 This is actually the saddest case of the three presented here because Ang Swee Chai was never wanted by the authorities for any outstanding charges and she left the country legally to join her husband, Francis Khoo, in London. She was interrogated for 72 hours by the ISD, where she claim she was mistreated, and released without charges. 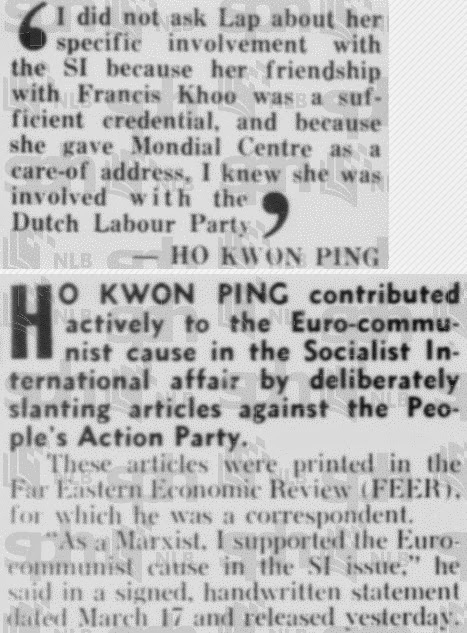 That is to say, she choose not to return home and stayed with her husband who escaped Singapore while he was being investigated for being part of the Euro-Communists in early 1970s. What makes this case even more poignant is that Ho Kwon Ping, who was investigated together with Francis Khoo, served a relatively short stint under the ISA, and went on to be the Chairman of Banyan Tree and the President of SMU. In fact, ASC did return to Singapore in 2011, to lay her husband's ashes to rest. When ASC returned, she was not harassed by the authorities but neither did she stay. She even spoke at the National University of Singapore Health Auditorium. So it's really interesting to see her yearn for home in the film, To Singapore With Love, yet knowing that she could easily make Singapore her home again in 2011. Or maybe it was simply more attractive to frame a dutiful wife as a political exile? So these are some of the men of and women featured in the documentary film, To Singapore WIth Love. Are they exiled by choice or because they were choice-less? The jury is out. Will the real exiles please stand up. Note: All screen grabs are from NLB archives of old ST.
Screen grab from That We May Dream Again FB page, started by those arrested under Ops Spectrum. Ang Swee Chai said like the govt was preventing her from coming back, but she actually came back and still decide to go back London. WOW! So much for chicken rice and laksa. Who could blame any of them given the record of the PAP govt in this respect? It is well known what happened to those unfortunate souls who were involuntarily made to 'stay' in terms of the physical and psychological torture and imprisonment without trial for years and in some cases for decades? The exiles have made positive lives with their stay in another country. Compare this to the mostly broken lives of those who did not manage to escape the ISD dragnet. Is that any way to treat a fellow human, let alone, as in the case of some of the ops Coldstore internees, those who were actually your bedfellows in the fight for independence? Now contrast this to the nations of Europe who were once on opposite sites in WW1 and WW2. Why, compare it to the virtual 'red carpet' laid out for the Japanese barely 2-3 decades after its military had committed some of the worst war crimes against the local civilian population during its WW2 occupation. If it is nitpicking, everyone can do it. The fact is that these exiles, voluntary or otherwise, had very valid fears to escape from the clutches of the security services. As stated above, look at those who did not get away. Did any, up to today, had been given a fair trial. Indeed, had any even been publicly charged in a court of law for their alleged offences? What is the case they have to answer for in an open court? And for that matter, how many had even stand accused of actual criminal acts and acts of violence? The British system allowed for the declassification of restricted and even secret documents and its record for that period have shone a light on hitherto 'unknown' behind the scene goings on, that more than vindicated some of the accused/detainees and have revealed enough to make the case that there were more than meet the eye of the stories and tales painted by the govt of those incarcerated without trial. Who is more right and who, more wrong, now is the time to let it all hang out and let public opinion be the judge of the veracity of each side's claims. It is time to close the chapter or chapters of this part of our 'growing up' history and pain. Let the parties be re-conciliatory. Let there be re-conciliation. Every one of us has but ONE life to live. Agree, some were kept longer that it was necessary. But NOW is good time to come back. Because of the political climate, internet, more opp support etc. So why not now or soon? In this respect, the ball is in the govt's court, surely. The ball is the exiles court rather than the government which is bound by law and precedent. Even the actual defamer G Nair was released and given a chance if he retracted.